5.6 earthquake hits the Ionian Sea. 5.2 earthquake hits the northern Mid-Atlantic ridge. 5.1 earthquake hits eastern Sichuan, China. 5.0 earthquake hits Unimak Island, Alaska. 5.0 earthquake hits the South Sandwich Islands. In the Atlantic Ocean: Hurricane Oscar is located about 660 mi…1060 km ene of Bermuda with maximum sustained winds…75 mph…120 km/h. Present movement…ne or 35 degrees at 22 mph…35 km/h. In the Western Pacific Ocean: Tropical Storm (ts) 31w (Yutu), located approximately 291 nm northwest of Manila, Philippines, is tracking northwestward at 08 knots. Italy – Violent thunderstorms, small tornadoes that blew roofs off homes, and hurricane-force winds lashed Italy from Piedmont to Sicily early this week, leaving at least 11 people dead, many more injured and firefighters and other rescue workers scrambling to respond to emergency calls. In Venice, ferocious winds drove the high tide to more than 61 inches, or 156 centimeters, above average sea level on Monday, one of the highest levels ever recorded, plunging much of the city under water. It was the highest flood in a decade in Venice, though far short of the record, more than 76 inches above level, set in November 1966. An enormous iceberg about five times the size of Manhattan broke off Antarctica’s Pine Island Glacier yesterday (Oct. 29), a mere month after a crack first appeared, satellite imagery shows. At 115 square miles (300 square kilometers), the enormous amount of ice that calved off the glacier’s ice shelf is even larger than the mass that broke off last year. However, the newborn iceberg didn’t stay in one piece for long. Within a day, it had splintered into smaller pieces, with the largest piece measuring a substantial 87 square miles (226 square km) before it later broke apart even more. The imagefrom NASA Earth Observatory shows the smoke from a large number of wildfires across southern New Guinea on October 8, 2018. 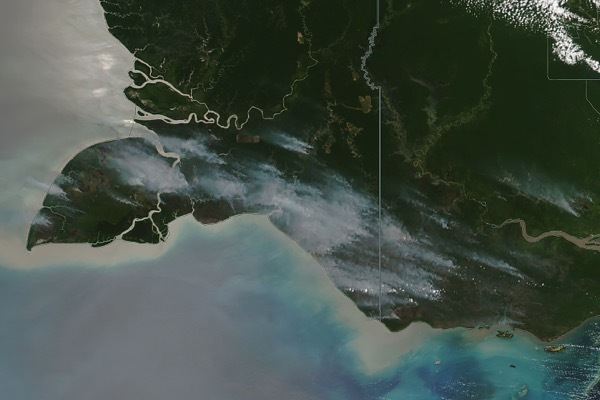 By October 25, there were more than 5,000 fires counts in this coastal portion of Papua New Guinea and Indonesia, according to the Global Fire Emissions Database. Most of the fires were set intentionally to clear the land for agriculture across both small farms and large palm oil plantations. The land clearing often occurs in drained peatlands, and burning peat makes a substantial contribution to greenhouse gas emissions. 6.1 earthquake hits North Island, New Zealand. 5.7 earthquake hits the Drake passage. 5.5 earthquake hits the Drake passage. 5.4 earthquake hits the Ionian Sea. 5.1 earthquake hits the Sunda Strait, Indonesia. 5.1 earthquake hits the central East Pacific rise. 5.0 earthquake hits the Ionian Sea. 5.0 earthquake hits the Panama – Columbia border. In the Atlantic Ocean: Hurricane Oscar is located about 470 mi…755 km ese of Bermuda with maximum sustained winds…105 mph…165 km/h. Present movement…n or 10 degrees at 13 mph…20 km/h. In the Western Pacific Ocean: Typhoon (ts) 31w (Yutu), located approximately 144 nm north-northwest of Manila, Philippines, is tracking westward at 15 knots. 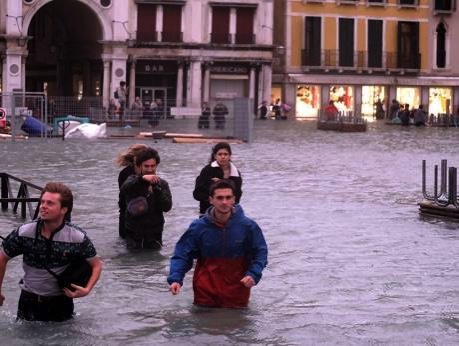 Venice, Italy – Venice was inundated by an exceptional high tide Monday, putting three-quarters of the famed Italian lagoon city under water as large swathes of the rest of Italy experienced flooding and heavy winds that toppled trees and other objects, killing six people. Vietnam – The annual flooding in the Mekong Delta has damaged more than 2,000ha of rice this year, according to the Ministry of Agriculture and Rural Development’s Directorate of Water Resources. More than 1,270ha of the crop in An Giang Province, 316ha in Kiên Giang and 182ha in Đồng Tháp were totally destroyed while 265ha in Đồng Tháp and 24ha in Long An were damaged. Most of the destroyed and damaged fields are in areas without embankments while the rest were damaged because their embankments were broken or too low. High tides too have been affecting agricultural production in the region, especially in Bến Tre and Sóc Trăng provinces and Cần Thơ City. In their recent State of the Mountains report published earlier in the summer, the Canadian Alpine Club found that the Saint Elias mountains – which span British Columbia, the Yukon and Alaska – are losing ice faster than the rest of the country. Previous research found that between 1957 and 2007, the range lost 22% of its ice cover, enough to raise global seal levels by 1.1 millimetres. The accelerating melt of the glacier has resulted in major shifts to water sources at lower elevations. In 2016, the meltwaters of the glacier shifted dramatically away from the Slims river, cutting off critical water supplies to Kluane Lake – a Unesco world heritage site. Since the diversion, water levels at the lake have dropped more than 6.6ft – stranding thousands of fish from their natural spawning rivers. Dust storms have begun to flare up along sections of the well-travelled Alaska Highway – at times halting traffic, the result of a dry river bed covered in glacial silt. The events at Kluane Lake are a precursor of what can be expected elsewhere. A total of 80 deep-water whales have been found dead on the Atlantic coasts of Scotland and Ireland since early August — more than 10 times the usual number over that time in previous years. Marine mammal scientists say the presence of the washed-up whales suggests an “unusual mortality event,” or UME, that could have killed up to 1,000 Cuvier’sbeaked whales in the North Atlantic Ocean in recent months. The cause of the whale deaths is unknown, but scientists fear they may be the result of warships using active sonar to hunt for enemy submarines, or naval anti-submarine exercises. Around 26 of the carcasses were Cuvier’s beaked whales, a species that lives mainly in the deep ocean, while the rest were either Sowerby’s beaked or northern bottlenose whales. Typically, just two or three dead beaked whales would wash up on the Irish coast each year. A similar increase in beaked-whale deaths has been reported along the west coast of Scotland. The sharp increase in the evidence of whale deaths washing up on the coast implied that a much greater number of whales may have been killed in the open ocean. Scientific research has shown that Cuvier’s beaked whales are sensitive to the very loud sounds caused by anti-submarine sonar, which is used by warships hunting for enemy submarines and during naval anti-submarine exercises. Scientists suspect the loud sonar sounds cause intense pain to beaked whales diving at extreme depths, so that they surface too quickly and die from decompression sickness. A spate of wildfires across the Garden Route, which have spread from George to the Karatara area, claimed the lives of at least eight people – including a newborn baby and its mother, two children and a toddler – on Monday, and led to the evacuation of hundreds of people. 6.2 earthquake hits the Drake Passage. 5.5 earthquake hits the Izu Islands off Japan. 5.4 earthquake hits offshore El Salvador. 5.3 earthquake hits Mindanao in the Philippines. 5.3 earthquake hits the Kashmir-Xinjiang border region. 5.0 earthquake hits southeast of the Loyalty Islands. In the Atlantic Ocean: Hurricane Oscar is located about 620 mi…1000 km se of Bermuda and about 620 mi…995 km nne of the northern Leeward islands with maximum sustained winds…80 mph…130 km/h. Present movement…w or 270 degrees at 12 mph…19 km/h. In the Western Pacific Ocean: Typhoon (ts) 31w (Yutu), located approximately 281 nm east-northeast of Manila, Philippines, is tracking westward at 09 knots. Malaysia – Ninety minutes of heavy rainfall this morning caused flash floods at the Penang International Airport affecting departures and flooding the parking area. Uganda – Following torrential rains that hit the Rwenzori Mountains, Kasese was inundated by flooding which claimed the life of one person and affected more than 8 000 people. Two children in Kanchanrup Municipality of Saptari district died of an unidentified disease on October 23 and 24 respectively. The victims suffered from a fever, nausea, headache and blood vomiting before they died. The case comes just two months after four persons, including two children, died and more than 2,000 fell ill due to an outbreak of an influenza that was later confirmed as Swine flu (H1N1) and Hong Kong flu (H3N2). 5.2 earthquake hits Kepulauan Talaud, Indonesia. 5.0 earthquake hits northern Alaska. In the Atlantic Ocean: Tropical Storm Oscar is located about 895 mi…1440 km ese of Bermuda and about 820 mi…1320 km ne of the northern Leeward islands with maximum sustained winds…65 mph…100 km/h. Present movement…sw or 235 degrees at 15 mph…24 km/h. In the Western Pacific Ocean: Super Typhoon (ts) 31w (Yutu), located approximately 501 nm east-northeast of Manila, Philippines, is tracking westward at 10 knots. Sudan – One man died and five others were wounded in major floods that have ravaged parts of Port Sudan, capital of Red Sea state. The torrential rains and ensuing floods that started on Wednesday evening are still continuing and affecting life in a number of places in Red Sea state. A young man drowned in the eastern part of Port Sudan. Five others sustained injuries when they attempted to cross streets in the city and were swept away by floods. UAE – Dubai: The road to Jebel Jais was closed on Sunday due to heavy rain and unstable weather, while the Ras Al Khaimah Police announces drivers urged to be cautious when driving in rainy weather and avoid valleys. This morning, water was seen gushing through the wadis in Jebel Jais and also causing some flooding on the roads. The director of the Research Institute for the Study of Leprosy reports seven Astrakhan patients being treated for leprosy. “Seven new cases have been identified in our region. Six are the sick for the first time, and the seventh is a relapse in a patient who is under observation”. All patients are elderly. In a follow-up on the record dengue fever season in Bangladesh, the Institute of Epidemiology, Disease Control, & Research reported an additional 600+ cases in the past ten days. This brings the total to 8,079, as of Oct. 24.